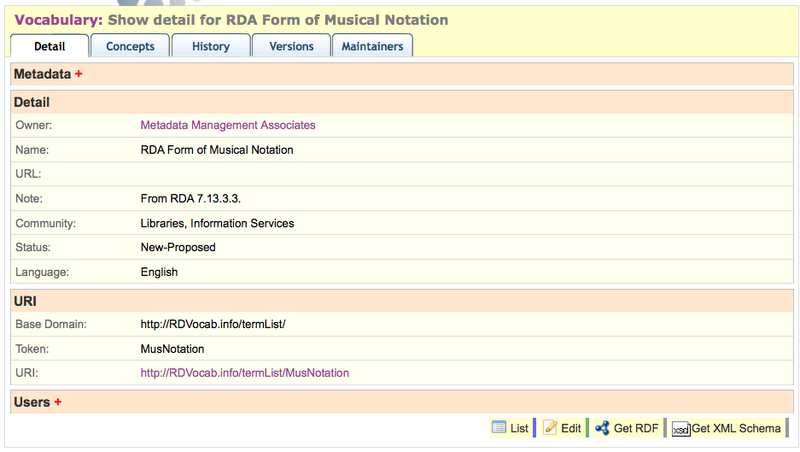 The instructions below are intended to assist users to begin working effectively on the [Open Metadata Registry]. The same instructions apply for users of the [Open Metadata Registry Sandbox]. The email address is used only for password retrieval, when a user forgets his or her password, is used for no other purpose, nor shared with any other service or individual. Results: A new user account is created. The user should note the login name and password, as well as the email address entered at the time of new account registration. Now that you are logged in, you can add a resource owner. Every schema or vocabulary must be owned by a resource owning agent, which can be registered as either an individual or an organization. To register an agent, click on the (Add) link next to Resource Owners in the Browse box on the right side of the page and fill out the resulting form. Owner Name and Email are required fields. As with user registration, email addresses are kept private. When you register an agent, you become the registrar of that agent and an Agent Administrator for that organization or individual. Other users and administrators can be added later. A Vocabulary Maintainer is defined as: "A registered user designated as responsible for maintaining a Vocabulary." The Vocabulary Maintainer is authorized to edit vocabulary properties and concepts. In the context of these instructions, the term Element is used to refer to Properties or Classes when a distinction is unnecessary. When only one or the other is addressed, for instance when instructions refer only to Properties or only to Classes the distinction will be made in the instruction. We realize that the use of the term Element is not optimal, but until the software is revised we will continue to use it as needed in the instructions. A set of properties or classes (also called here an Element Set or an Element Vocabulary) starts with a description of the set or vocabulary as a collective whole. Once the Agent has been registered, a new vocabulary form can be invoked by clicking on the (Add) link showing after the Element Sets link on the right hand browse menu (note that the (Add) portion will not appear if the user is not logged in, and clicking on the Element Sets link will produce a link of already registered Element Sets). A basic template allowing a description of an Element Set will appear, divided into sections. In general, users should tab through the form to take best advantage of the Registry defaults. User is provided with a drop-down list of all the agents for which the user is enabled to act. The user must choose one to be the owner of the vocabulary. The label is a human-readable descriptive label for the element set as a whole. This text will be displayed in lists of element sets and should be optimized for a human reader, preferably without combined words or camel case. The user provides here unique token representing this particular element set. This will be used as the prefix identifying this URI in RDF or a qname in XML. This name should be terse and contain no spaces. Camel case is preferred. The URI assigned to this element set. By default this will be a concatenation of the Registry default domain and the element set Name. If another domain is desired for the Element Set and its individual properties, the desired namespace must be entered here manually, overriding the normal Registry default. The namespace designated here will then become the default for the registration of individual properties later on in the workflow. A non-Registry URL that contains more information about this element set. This information is optional, but useful, if the vocabulary already has a presence on the web. A note about this element set. This is optional, and may contain any information that may be relevant to users of the vocabulary. In this space may be entered free text tags identifying communities of practice for which this element set is intended. At present, it is not possible to use these tags to search for related vocabularies, but this functionality will be added later. The drop down menu supplies a status that will serve as a default status for the properties of this element set as they are created. Once a vocabulary is registered, the statuses of individual properties must be changed individually--a change made to the vocabulary as a whole will not proliferate throughout the vocabulary. This allows each property to be maintained separately as part of a vocabulary development process. The drop down menu supplies a default language for the properties of this element set as the properties are created. When desired, individual property statements can be overridden with a non-default language, providing the capability for a multilingual property vocabulary. 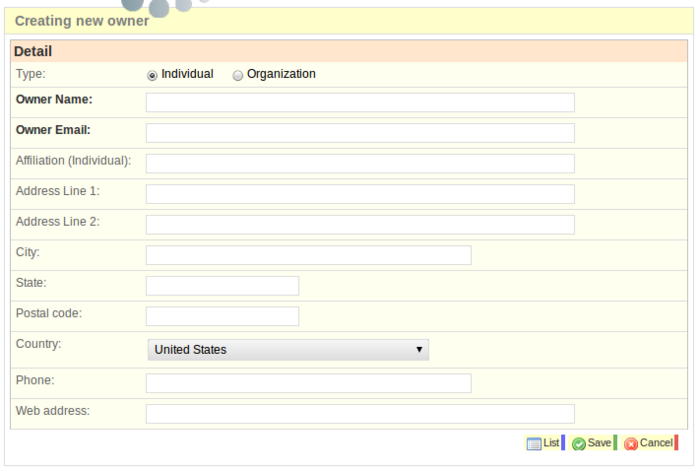 When the desired parts of the form are filled in, the user should click on the SAVE button at the bottom of the page. Elements will display in the order that they are entered. The display can be changed to Alphabetical or Reverse Alphabetical by clicking the 'Label' link on the blue section above the list. When the sort is changed a small arrow indicating the direction of the sort will appear. A drop down menu allows the use of four types: class, subclass, property, and subproperty. This is a human-friendly label for this property and is required for every Property. The label should be optimized for human viewing and may have spaces. Combined words and camel case are not recommended. This is a machine-compatible label for this property and is required for every Property. Names should begin with lower case for properties/subproperties and upper case for classes/subclasses, and should not include spaces. Combined words and camel case ARE recommended for names. The URI is generated by the system, based on the default supplied in the vocabulary description created earlier, but it may be overridden by the user. A description of the property or class. In most cases the description should be a formal definition. The comment may be an extension of the definition with examples of use, or a comment on the usage of the property in special cases. This is the overall status of this Element. Individual elements of this property may have a different status. This is the default language for all statements of this element. If languages other than the default are desired for particular statements, the default language can be overridden. Notes for the application of particular statements or to reflect sources of definitions or other relevant human-readable purposes can be added here. 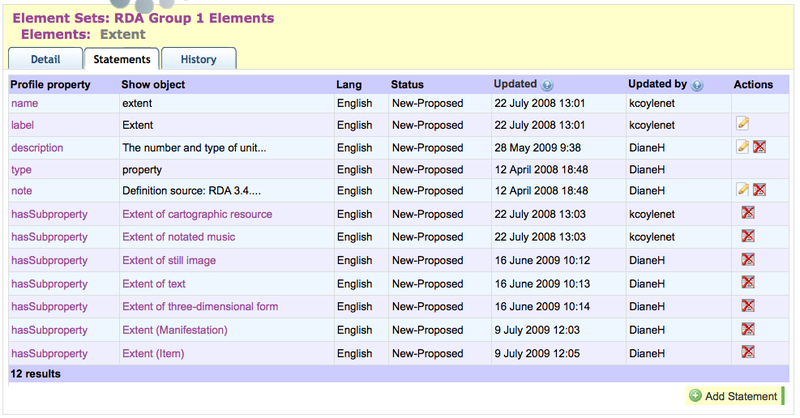 Additional classes or properties needed for the element vocabulary can be added by repeating the process. 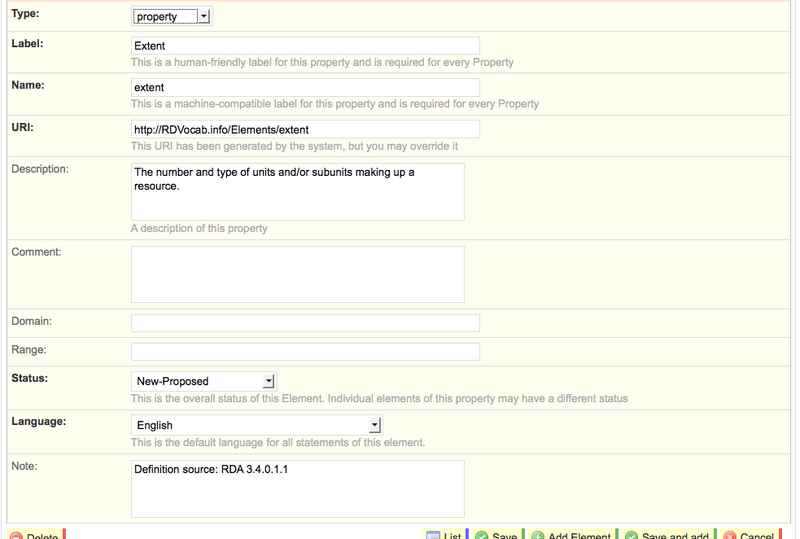 Subclass and subproperty relationships should be added after the Classes and Properties have been completed. The Registry expects that when an element is a subclass or subproperty, the higher level is already present. 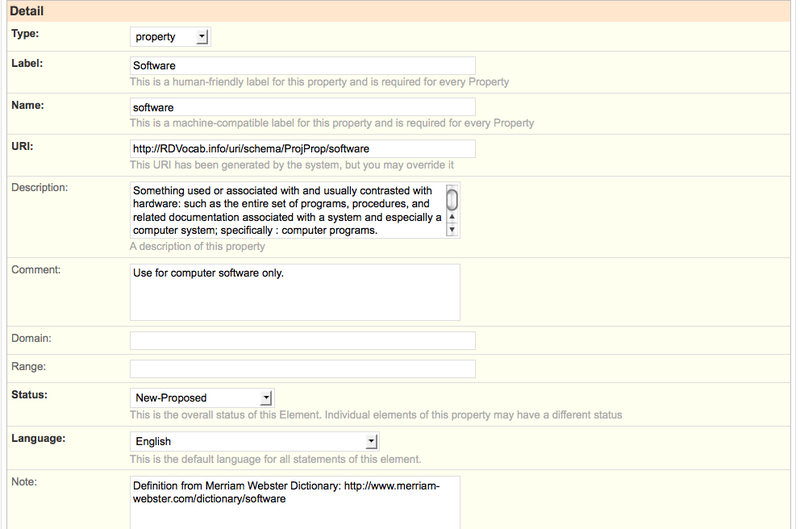 When describing a subclass or subproperty, a drop down list presents all classes or properties available in the vocabulary, ensuring that only appropriate relationships are made, and that relationships are reciprocal. 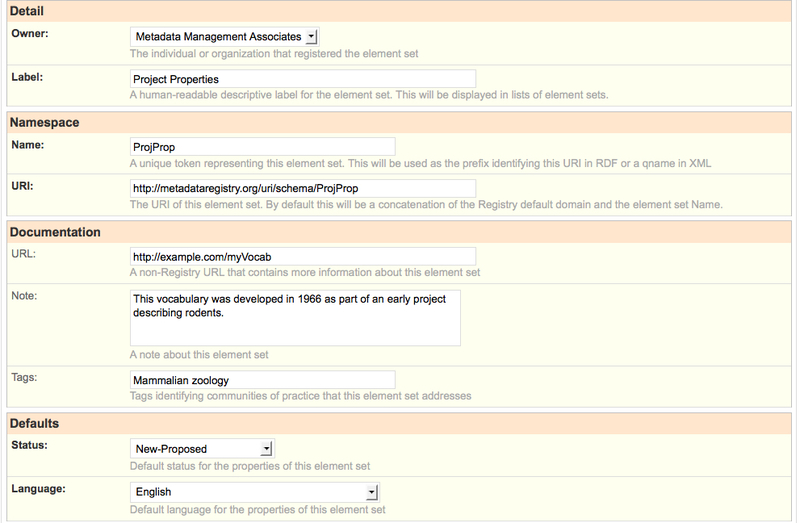 When a set of elements/properties are initially registered, a number of maintenance actions are available to manage the vocabulary. Data can be edited (corrections, additions of text to definitions, deletions, etc.) or extended (statements added, relationships added). Once the edit screen is displayed, any visible data can be modified and any empty text boxes can be filled in. Note that when displaying the detail for a class or property, information on subclass or subproperty relationships does not display in this view and cannot be added or edited from the detail edit screen. See the instructions for Extending Existing Elements/Properties to add or edit those relationships. An alternate approach to editing, which allows access to all the properties at a statement level (including subclass and subproperty relationships), starts from the list of Elements. Clicking on the element to be edited, and, when the detail is displayed, clicking on the Statements tab, provides a list of all property statements, with available actions in the right hand column. From this view, the actions available for each statement are visible in the right hand column. Some statements can be edited, others can be deleted, and the defaults (which show no actions in the right hand column) show no actions; they must be changed using the detail edit screen shown above. 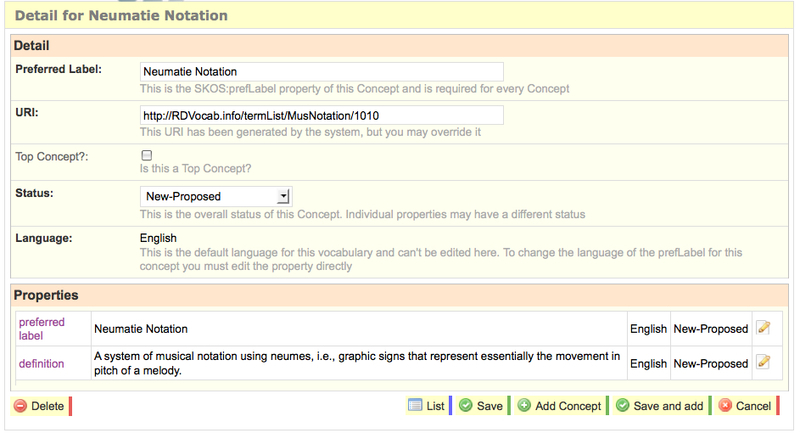 At the bottom of the display, a button to invoke a form to add new statements can be clicked. This is one method available to add new hasSubproperty relationships from the property itself (the other method is to add a new 'parent' property to a subproperty). Because element properties can have multiple relationships, care should be taken to ensure that reciprocals are correct. Because existing relationships cannot be edited directly via the detail editing screen, relationships that require change must be deleted first, then added back in their changed version. See Vocabulary and Thesaurus Construction Resources for general information on vocabulary development. The Open Metadata Registry uses the [Simple Knowledge Organisation System (SKOS)] as the basis for building concept vocabularies. Building a set of concepts starts with a description of the vocabulary as a collective whole. 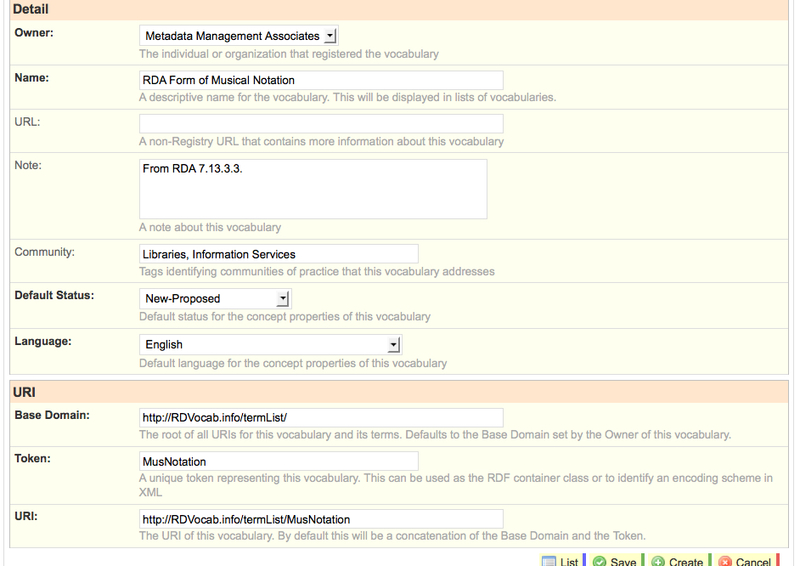 Once the Agent has been registered, a new vocabulary form can be invoked by clicking on the (Add) link showing after the Vocabularies link on the right hand browse menu (note that the (Add) portion will not appear if the user is not logged in, and clicking on the Vocabularies link will produce a list of already registered Vocabularies). A basic template allowing a description of an Vocabulary will appear, divided into sections. In general, users should tab through the form to take best advantage of the Registry defaults. The name is a human-readable descriptive label for the element set as a whole. This text will be displayed in lists of vocabularies and should be optimized for a human reader, preferably without combined words or camel case. A non-Registry URL that contains more information about this vocabulary. This information is optional, but useful, if the vocabulary already has a presence on the web. The root of all URIs for this vocabulary and its terms. By default the Registry assigns the Registry domain, but this may be overridden by another Base Domain typed over the default by the Owner of this vocabulary. The user provides here unique token representing this particular vocabulary. This will be used as the prefix identifying this URI in RDF or a qname in XML. This name should be terse and contain no spaces. Camel case is preferred. The URI assigned to this element set. By default this will be a concatenation of the Registry default domain and the vocabulary Name. If a domain other than the Registry default is desired for the Vocabulary and its individual properties, the desired namespace must be entered here manually, overriding the normal Registry default. The URI designated here will then become the default for the registration of individual properties later on in the workflow. This is the SKOS:prefLabel property of this Concept and is required for every Concept. This is intended to be a human-friendly label for this property and should be optimized for human viewing--it may have spaces. Combined words and camel case are not recommended. The URI is generated by the system, based on the default supplied in the vocabulary description created earlier, using a sequential number assigned by the the system to create a unique URI. Owners who prefer a non-numeric extension may override the default by typing in their preferred name. A check box is provided to allow identification of concepts at the top of a hierarchy of relationships. This is the overall status of this Concept. Individual concepts in this property may have different statuses. This is the default language for all concepts of this vocabulary, which will be extended to each concept. If a language other than the default are desired for particular concepts, the default language can be overridden by editing the Language at the statement level. Additional concepts needed for the vocabulary can be added by repeating the process. Relationships between concepts should be added after the initial registration of concepts themselves have been completed. The Registry expects that when a relationship is asserted, that both levels are already present. When building a relationships between concepts, a drop down list presents all concepts available in the vocabulary, ensuring that only appropriate relationships are made, and ensures that relationships are reciprocal. When a set of concepts are initially registered, a number of maintenance actions are available to manage the vocabulary. Data can be edited (corrections, additions of text to definitions, deletions, etc.) or extended (statements added, relationships added). Starting with a list of existing concepts, either click the edit button to the right of the concept, or go to the detail for the concept itself by clicking on the name or URL from the list. Once the edit screen for the concept is displayed, any visible data in the Detail section can be modified and any empty text boxes can be filled in. To edit the additional properties below the Detail box, either click on the edit button that appears to the right of the property, or choose the Properties tab and either click the edit symbol to the right of the property to be edited or select the display for that property to select the edit button under the display. Both these strategies present an "Add Property" button so that additional properties can be added as well as existing properties edited. The registry features a SPARQL endpoint, allowing queries of registered vocabularies and element sets. For an introduction to SPARQL and instructions for using the endpoint, read the SPARQL page on this wiki. This page was last modified on 29 September 2010, at 22:18. This page has been accessed 5,368 times.